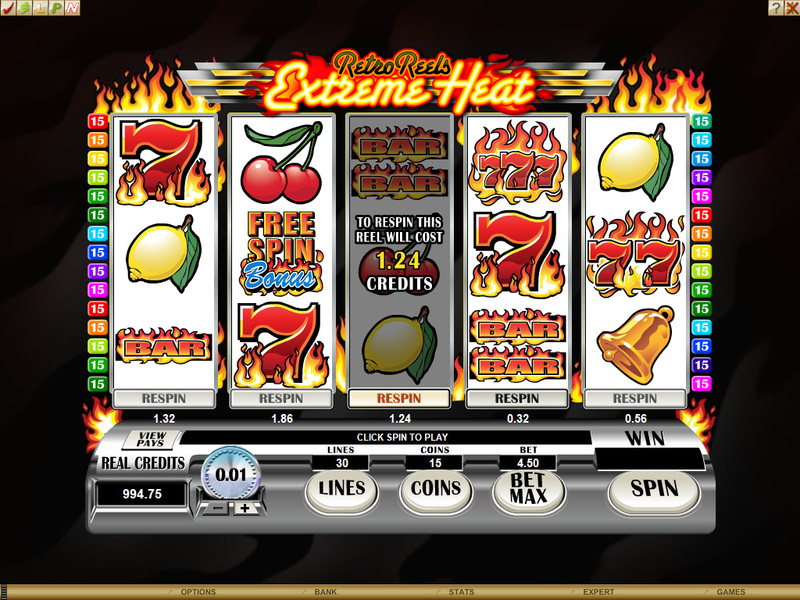 You can burn up the screen with fiery wins in the NEW 5 Reel, 30 Payline, Multi-Coin slot – Retro Reels – Extreme Heat! The scorching Dollar Symbol is appropriately the Wild and will substitute for all symbols except the Scatter to help players to sizzling wins. The Free Spins Bonus Symbol is the Scatter and can be incredibly lucrative find 3 or more of these Symbols in any position across the Reels and players can profit handsomely. 3 Scatters will trigger 10 Free Spins, 4 Scatters will entitle you to 15 Free Spins and 5 Scatters will land you a whopping 20 Free Spins. ALL wins during Free Spins are DOUBLED. Players can win a searing jackpot of up to 37,500 in the base game or a blistering 75,000 with the help of Free Spins!